Pacific Gateway Marina, built on the south shore of Port San Juan in Port Renfrew, is so new it doesn’t show up on even the most updated charts. It’s still a marina in evolution but the most important aspects are in place: the heavy breakwater, a set of sturdy docks, a fuel dock and fish-cleaning stations. The breakwater is essential, as the frequent west and southwest winds funnel up Port San Juan and there’s not even a small land protrusion to shield a vessel from the wind and waves. Years ago, we anchored here and we rocked and rolled throughout the night; we never stopped again on the way to and from Barkley Sound. And we aren’t alone. One of the impediments to cruisers visiting Vancouver Island’s west coast from the south has been the long slog from Becher Bay or Sooke to Barkley Sound. The approximately 90- mile run is a daunting distance, especially for smaller sailboats. Catching an ebbing tide can help during the trip, but you must fight the flood at some stage. That’s why having a safe stop at Port Renfrew’s marina is such a pleasure—it cuts the voyage into two almost equal segments. This heavy-duty breakwater was built to protect the marina against any weather. We sped through Race Rock Passage, with its black-and-white ringed lighthouse starkly outlined against the glacier-capped Olympic Mountains. Whirl Bay presented a surprisingly strong back-eddy where lat circles were ringed by tiny whitecaps—small white horses on a trot—halved our speed. A fishboat so laden its gunnels nearly touched the water passed by. We anchored in Becher Bay behind Wolf Island and spent the afternoon recovering from the bustle of getting ready for a seven-week cruise. Early the next morning, we began the 50-mile passage to Port Renfrew. PACIFIC GATEWAY MARINA From a distance, the new rock breakwater on the marina’s northwest and southwest sides is high enough that only the white-hatted pilings show. The new facility replaced an old, unprotected marina whose docks were deployed only during the summer. Sport-fishing boats are the new dock’s primary occupants while both sides of a long finger offer transient moorage for vessels up to 80 feet. We had five metres under the keel at low tide. PGM is part of the Mill Bay Marine Group, which has purchased, built or refurbished five marinas in B.C. over the past several years, including this one, Mill Bay, MK Marina in Kitimat, Port Sidney and Port Browning. A high wall, made up of grey igneous rock and brittle layers of black shale, looms behind the marina. It’s where the breakwater was born. “It took several years to get the permits in place,” said Glenn Brown, whose wife Vicki Asselin, is the marina site manager. “We started blasting in January 2016. Three 50-ton and two 30-ton excavators loaded the rock into trucks. Down a newly built road, the trucks backed up to the water and dumped their loads until the rock remained above water. As the breakwater grew, they’d back up further, on and on, seven days a week from late May until the end of September until the barrier rose two metres above high tide. Plans for the marina are on-going. Water and power are slated for installation in 2018. Once a sewage treatment plant is built, laundry, showers and toilets will replace the porta-potties. The post-and- beam structure at the top of the dock may become a restaurant; in the meantime, a Bridgeman’s food truck sells burgers and other fast food. A hotel will be built at the bottom of the rock wall and cottages will occupy the acreage owned by the development. Purdey has already installed a helipad so he can visit the marina—and fish—frequently. LATER THAT DAY, I met a group of fishing guides, baseball caps in place, relaxing at a picnic table with a beer, a smoke and fried onion rings. A strong part of the local culture, they’d had a successful day with their B.C. and Alberta-based clients, each having caught their quota of two chinook salmon and one halibut (two coho later in the season).“They must all have their fishing licence before they come,” said self-appointed spokesman, Brannon Derek. “We take a maximum of four passengers and charge up to $1,300 a day. Plus tips, of course. Fishing guide John Wells has lived in Port Renfrew for 17 years and loves the freer, non-city aspects of the outdoor life. He has the build and complexion of some- one who spends most of his time on the water and in the sun.“This is a great place to live,” he said. “I like the natural beauty of this region. It’s outdoor living yet we’re close to Victoria if need be. We’re lucky up here, leaving the city stress behind. In the winter, I hunt deer and Canada geese.”Then, looking up at me from under his baseball cap’s rim, he asked if I liked crab. “Who doesn’t?” I answered. “Well,” he said, “you see those traps on the first dock? Go haul out that line next to them and you’ll ind crabs in the crab hotel. Take what you want.” This generous offer wasn’t wasted on us; we fished out three lovely Dungeness and had a feast. PROVISIONING IS SCARCE in Port Renfrew. A small general store serves the 250 year-round residents and visiting hikers and campers, but for most, it’s too far to walk to from the marina. However, if you’re tired of cooking aboard, besides the food truck, three eateries are easily reached on foot. You can follow the road around or take a bit of a short cut by climb- ing the 122 steps to the upper road.You’ll skip-quickly ind Tomi’s, a small place serving breakfast and lunch. At exactly one kilo- metre from the marina, Coastal Kitchen Café is operated by Chelsea Kuzman. The café cooks breakfast and a lunch that includes calamari, salmon, halibut, burgers and pie. I ate lunch at the Renfrew Pub (1.3 kilometres from the marina), once the Port Renfrew Hotel. It burned down in 2003, was rebuilt as the pub and now rents cottages down the boardwalk that also leads to an unprotected, seasonal government dock. Visitors come here for holidays, or stay before hiking the West Coast Trail, which runs between Port Renfrew and Bamield, or the less strenuous Juan de Fuca Trail (heading south from Renfrew.) The well-known Botanical Beach and the start of the Marine Trail are located another 2.5 kilometres down the road. Depending on weather and tides and the time visitors have, Big Tree Tours can tailor tours to include visits to Sombrio Beach and Botanical Beach. Atavar-Grove. The tree in the foreground is an old-growth redcedar. The tree in the background is a giant Douglas-fir. 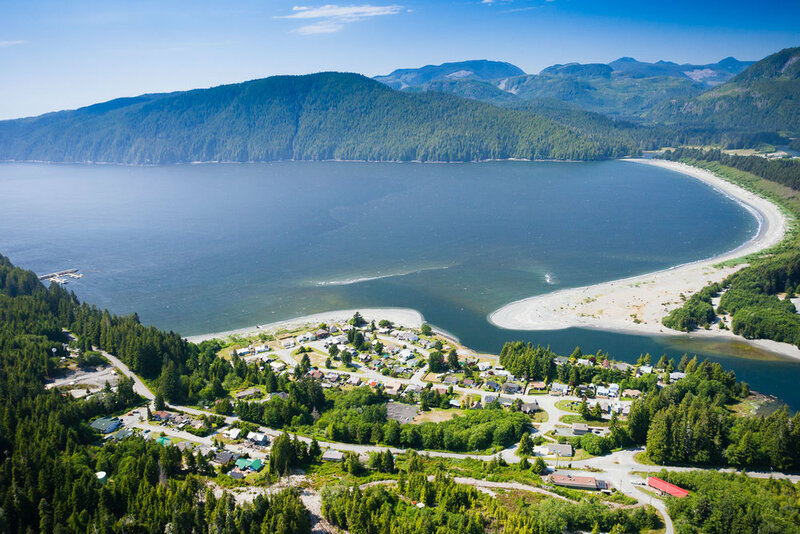 Port Renfrew is rebranding itself: “Wild Renfrew—Wilderness within Reach.” Vacation cottages are springing up. The Chamber of Commerce sees tourism as a job creator. The new marina for boaters and the planned accommodations on its site will add more allure for visitors. With all these visitors, by sea and by land, will Port Renfrew become less wild? Will it lose its small-town, rough-hewn character? Perhaps, but not for quite a while yet. Before Spanish explorer José Maria Narváez called the inlet “Port San Juan,” the Pacheedaht First Nation, meaning “People of the Sea Foam,” had their village sites around the bay. according to Raincoast Place Names, Narváez arrived here on June 24, 1789, the date purported to be John the Baptist’s birthday. The Port’s name honoured this New Testament figure, a favourite in Spanish Catholicism. Captain Vancouver recorded the name on his charts. The European settlement at the head of the bay also called itself San Juan, but continual confusion with the U.S.’s San Juan Island led to a renaming. Port Renfrew may refer to the Prince of Wales, who also holds the title of Baron Renfrew. 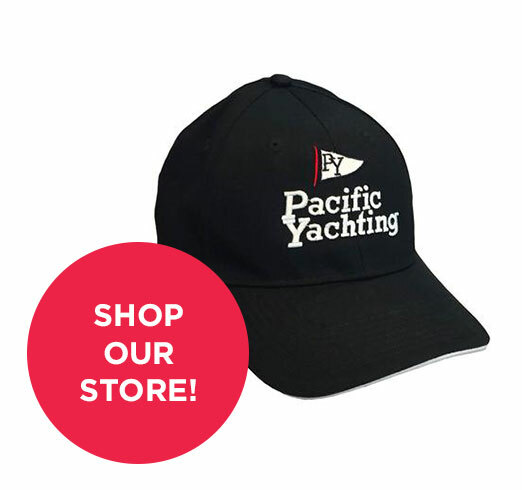 This article was featured in Pacific Yachting's October 2017 issue. Order it from our Shopify store now (while supplies last) or subscribe to our Digital or Print & Digital editions to gain access to over 15 years of archives!